DottyAR | InstantAR - First Instant Augmented Reality viewer from your website. DottyAR is the new way to view and share 3D models online in Augmented Reality. InstantAR Preview button - Add it to your site now. Instantly preview any 3D model in Augmented Reality on iOS, Android and Desktop Web3D. Want early access to InstantAR¹ Pro? Contact Dotty here to apply. ¹ What is InstantAR Pro? InstantAR Pro is an InstantAR button which displays any 3D model in Augmented Reality without pre-generated button code. It connects to Dotty's automatic service and returns an AR preview for any model at any time directly to your website. This allows your website to offer InstantAR previews with one simple piece of button code and scale it across your entire 3D content library. 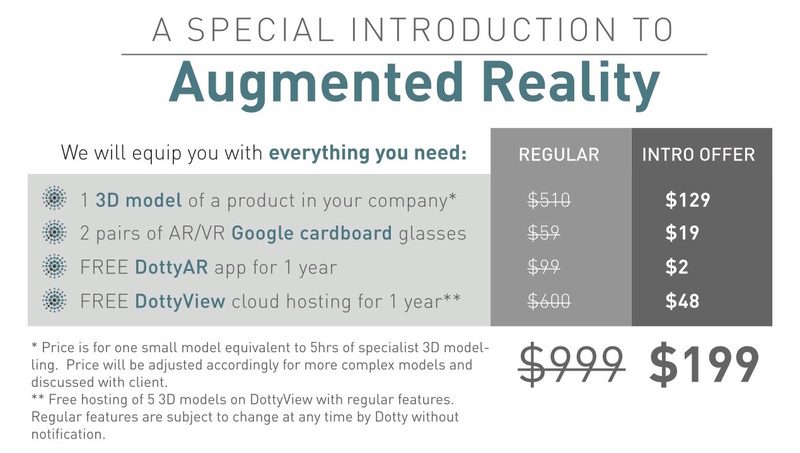 Be the first in your industry to implement this advanced AR preview platform. Your request has been received! Our representative will contact you shortly.